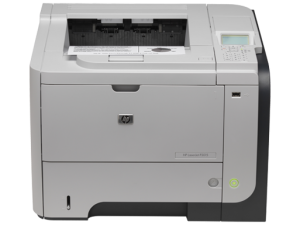 The HP LaserJet P3015n is a mid-size, monochrome (black and white) printer aimed at small and medium business use. Some of you may have used its predecessor, the P3005n. If so, there is a good chance you ran into some issues, specifically one in which your repair man told you the ‘formatter’ was messed up. This was certainly the problem we saw the most. Well, this problem has been fixed in the newer P3015n . Aside from fixing the formatter issue, there have been a number of improvements. The 3015n prints at 42 pages per minute (ppm), 20% faster than the 3005n, and it will get the first page to you 2 seconds faster at 7.5 s. This is in large part due to better inner workings; the internal processor on the 3015n is clocked at 540 MHz, as opposed to 400 MHz on the 3005n. The printer is made to handle between 1,500 and 5,000 pages per month, optimally, and depending on your cartridge, you should expect to see printing cost of 0.0247 cents per page (cpp) with a standard yield OEM cartridge. Using aftermarket cartridges can get you down to 0.02 cpp, while a high yield OEM cartridge will get down to 0.0179 cpp, and a high yield aftermarket will go to 0.0096 cpp*. This printer has a lot going for it. We have run into a few printers (hardly any at all) that have had issues jamming at the fuser, or when powering on the printer. However, these issues disappeared with replacing the cartridge. This printer gets two thumbs up from us, and the standing ovation of several customers requesting units for home use as well.